Global polyethylene demand will rise 4.0 percent yearly to 99.6 million metric tons in 2018. The Asia/Pacific region will remain the largest and fastest growing market, driven by China. Following a decade of decline, North America will add nine million tons of production capacity through 2023. 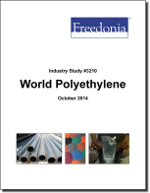 This study analyzes the 82 million metric ton world polyethylene industry. It presents capacity, production and demand forecasts for 2018 and 2023 by product (HDPE, LLDPE, LDPE), market (e.g., packaging, consumer goods, construction), world region, and for 27 countries. The study also considers market environment factors, details industry structure, evaluates company market share, and profiles 36 industry players, including Dow Chemical, Exxon Mobil and SABIC.